As soon as I saw these beautiful Swarovski Marguerite crystals I knew I had to buy them! I wanted to make sure I showed them off as much as possible and didn’t distract from them with other showy or shiny beads. 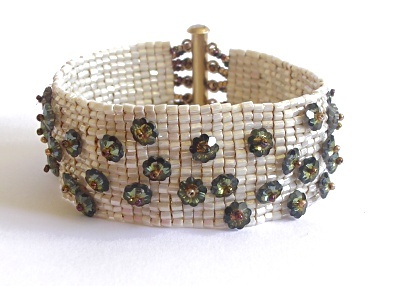 The result was this square stitch cuff, which uses two different sizes of seed beads and was embellished with the crystals as I went along.